A captivating and powerful exploration of the opioid crisis - the deadliest drug epidemic in American history - through the eyes of a college-bound softball star. 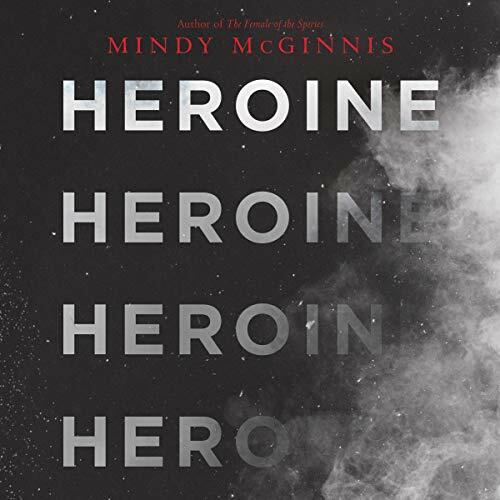 Edgar Award-winning author Mindy McGinnis delivers a visceral and necessary novel about addiction, family, friendship, and hope. With a new circle of friends - fellow injured athletes, others with just time to kill - Mickey finds peaceful acceptance and people with whom words come easily, even if it is just the pills loosening her tongue. Even before you get to the chilling first line (“When I wake up, all my friends are dead”) you know that this is the sort of story where everything is eventually going to fall apart, and you’ve come to watch the train wreck and hope that something can be saved at the end, and you can’t be entirely sure that it will be. I listened to this book in a single day, after seeing the prologue and first three chapters in a preview shared on Twitter last week. The first-person voice is made all the more powerful by the narration which pulls you in and adds depth you don’t get from a page. The characters are so real. I prefer the relationships. Amazing prose. The narration sounds like a young Julia Whelan in this book. My first reaction after reading this book was, "Damn!" I won an ARC copy of Heroine a week before its release, so I made room for it, throwing all other books on my TBR list out of the way to get to it as soon as possible. I read it the day of its release, after having finished The Cuckoo's Calling just two days before. I didn't start any other book but chose to wait until I received the audiobook I pre-ordered in order to read this book right away. I didn't really know what to expect. I will admit that I was kind of scared/nervous to read this book. I knew, after reading the blurb in the back of the book, that this was going to be a book that hit on a very serious topic. I knew that it was going to bring into awareness a very important issues. I wasn't sure if I could handle it, didn't know if I was prepared to read something like this. When I first started, the very first chapter grabbed my attention. The structure of the novel and its introduction of Mickey's accident at the beginning allowed me to be interested in her and what was going to happen to her. I wanted to know what she was going to go through and the complications that were going to arise as a result of the accident. The progression of the story allowed me to see Mickey's growing problem. It allowed me to empathize with this character. Reading her story allowed me to not only empathize with her but with anyone who had a story like her. The entire story brought to my awareness the struggles with addiction and the ignorance most of us have about how those individuals got to that state. This was a very daring story, one that focuses on humanizing people with addiction and shifting the audience's attention to not see them as junkies but as people, people who have made a mistake, people who deserve our attention, our support, and our awareness. I would like to note that this novel does have an abundant amount of profanity. I would like to advise that to those of us who do not enjoy books with a lot of that in it. I listened to the audiobook while reading along and found it to be a little uncomfortable, so keep that in mind if you are listening aloud where others can here or if you are choosing a book to read for your teenagers. There is depictions of drug use as well, so again, keep that in mind if you are a parent wondering if this is something you want your youth to read. It is definitely a powerful novel and raises awareness to the severity of drug addiction, but keep in mind that the author does not hold back. I loved the author's willingness to write this novel. Pressley's narration at 1.0 speed was slow but extremely well done. To really get into this story and if you have time, I would recommend listening at this speed. It's a bit dramatized, which I found amazing and the reason I would want to listen to it at this speed. At 1.25 speed, her narration is about as normal conversation speed. For those of us who like to multitask and listen on the go, I recommend listening at at either a 1.50 speed so one does not miss anything. For those who are listening while reading the book, I found 2.0 and 2.5 speed to be the best speeds. 3.0 and 3.5 speed was too fast for me, and I was missing a lot of what the narrator was saying and had to eventually slow down the narrator's reading speed. Absolutely Amazing just plain great!!! Shockingly Relevant this story should be read by all. There is an epidemic that is so hard to understand and this story is all too real. Touching.